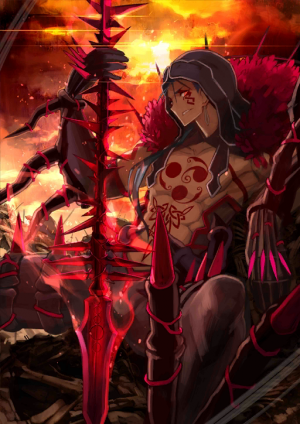 This article is for the 5★ , Cú Chulainn (Alter). For 3★ , see Cu Chulainn; for 3★ prototype version, see Cu Chulainn (Prototype). For 3★ , see Cú Chulainn (Caster). Decrease all enemies' ATK (3 turns). Decrease all enemies' Critical Rate. (3 turns). Increase your Buster Card effectiveness by 6%. Increase own NP damage by 30%, and Revive with 20% HP when defeated (1 time). The legendary warrior from the Ulster Cycle of Celtic Mythology. 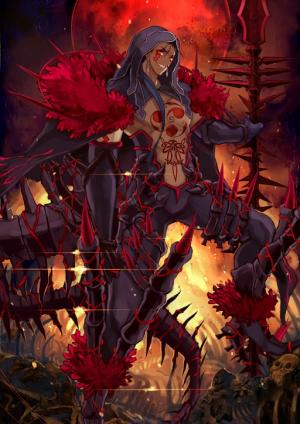 A member of the Red Branch Knights and the strongest warrior of Ulster, he made his name by using the spear techniques taught to him by Scáthach, the ruler of the Land of Shadows. Unlike his usual class, he materialized as a Berserker. 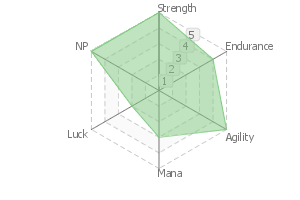 Some factor has caused his equipment to change, and his personality to be altered as well. His expression is cruel, his crimson spear has been mixed with black, and his overflowing with an ominous aura. He uses his rune spells solely to enhance his physical powers. The fierce roar from a rampaging Cú Chulainn awakens the spirit of the land, and shatter the minds of the opposing enemies. A type of mental interference. The affected enemies will suffer temporary reduced strenght and agility. 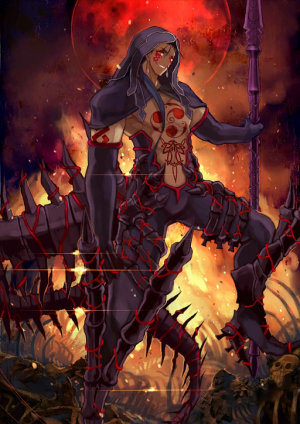 The altered and twisted form of Cú Chulainn, summoned by Queen Medb's wish. This is not what his berserker form is supposed to be in life, nor how he is supposed to be when summoned as a Berserker. When receiving the backup from the Holy Grail, his power surpasses his Lancer or Caster form. Gouging Piercing Spear of Carnage. A homing demonic spear missile. Cú Chulainn's original Noble Phantasm. It can inflict Death on all enemies, and even enemies with Death resistance will suffer large amounts of damage. The Beast of Crunching Deathtusk. 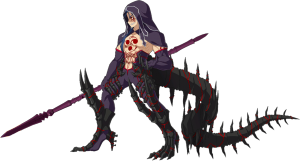 In his rage Cú Chulainn temporarily embodies the exoskeleton of the Curruid, a sea monster whose body was used to create the Gáe Bolg, and wear it like an armor. An offensive-type bone armor. By wearing it, he increases his endurance and his strength parameter become EX. He cannot use Gáe Bolg while activating his Noble Phantasm. A calamity class enemy from the Fifth Order. Since it came to this, I believe it would be better to just summon a certain Archer that equipped a mythological Mystic Code as a protagonist and have them fight in a mysterious space from a Sunday morning show, but what do you think? A brave warrior from Celtic, Ulster mythology. A member of the Knights of the Red Branch and the strongest warrior in Ulster, a hero who won fame by employing the invincible magic spear received from the leader of the underworld Scáthach. Unlike normal, he has manifested as a Berserker. By some sort of cause, the equipment all over his body has changed and his personality inverted. He employs rune magic only to compensate for his own body. Cu Chulainn's growl awakens the spirits sleeping on the land and breaks the minds of enemy army's soldiers. A mental interference. The STR and AGI parameters of the entire enemy camp temporarily Rank DOWN. 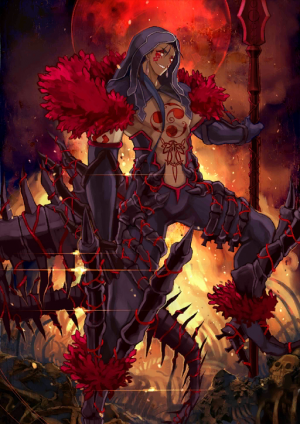 Cu Chulainn's mutated figure by means of Queen Medb's desire. He wolfs down on the land of America as Mad King Cu Chulainn. This is not even the mad warrior condition from when alive; he has been summoned as different figure than a proper Berserker. When receiving the backup from the Holy Grail, his strength surpasses even when in Lancer or Caster conditions. Cu Chulainn's proper Noble Phantasm. Because, while an Alter, he performs a full-power thrown while prepared for the collapse of his own body, both power and effective range have raised when compared to normal summoning. There is an instant-death effect towards the entire enemy camp and, even if instant death is avoided, it still gives great damage. 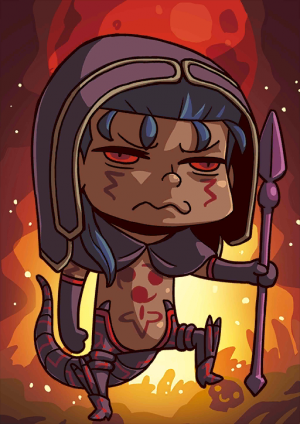 (Because he is throwing while 「making the collapsing body regenerate」 by means of rune magic, Cu Chulainn receives no damage himself-- if you exclude outrageous amount of pain). 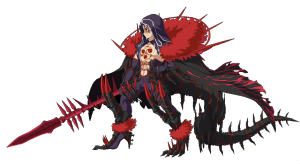 The anger of the raging Cu Chulainn temporarily embodies the exoskeleton of Marine Beast Curruid - the monster of the crimson sea that became the basis for the magic spear Gae Bolg - and clads it over his body like an armor. Attack-type bone armor. By wearing it, END is Rank UP and STR parameter becomes EX. While this Noble Phantasm is active, he cannot employ the 「Spear of Gouging Massacre」. This page was last modified on 13 November 2018, at 17:13.